Baltimore: Latest entry on world sake map? For those seeking an unusual Japanese dining and drinking experience, look no further than the Four Seasons Baltimore. The luxury hotel’s newly opened Pabu Restaurant offers its patrons an array of Japanese delicacies — and at least 100 brands of sake, including 30 by the glass. The eclectic menu here includes items including tako (grilled octopus) for $9, and Maryland crab okonomiyaki (fried egg, pork belly, karashi mayo) for $10. The signature item here is Pabu’s “Happy Spoon” — a combination of oyster, uni, ikura, ponzu céme fraîche with sesame ($5.88), which Saveur magazine recently said was one of the best reasons to visit Baltimore. When it comes to drinking, however, sake wins hands-down at this restaurant. Sake (pronounced “SA-kay”) is a fermented rice beverage containing 12 percent to 21 percent alcohol. Produced for the last 2,000 years, it is the Japanese national drink — and at least 18,000 versions of sake are known to exist. “It has to be produced in a traditional method that’s congruent with the outlines laid out by Japan’s Department of Taxation,” says Tiffany Dawn Soto, beverage manager at Four Seasons and the first non-Japanese woman ever to earn the title of “kikizake-shi” — master sake teacher. Born in San Diego and reared in Las Vegas, the 30-year-old Soto majored in advertising at the University of Nevada. That’s where she took a wine-tasting class and discovered her calling in life. Her husband, Ryan Cianci, is a sommelier and law student at the University of Baltimore. In his spare time, he lobbies for an organization called Marylanders for a Better Wine Law, which claims 25,000 members. To educate the public on the joys of sake, Soto has begun teaching classes at 4:30 p.m. the second Saturday of every month at Pabu. Bartender Nick Jones pours cocktails at the Japanese-themed Pabu Restaurant, part of the Four Seasons Hotel in Baltimore, Maryland. As if that’s not enough, sake is also gluten-free, vegan and in some cases even kosher. 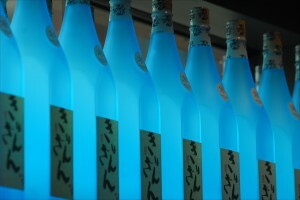 Soto said Pabu stocks bottles ranging in price from $12 to $1,500, though most of its brands fall into the $50 to $100 range. “I prefer to serve it in a glass that best amplifies whatever is special about that sake,” said Baltimore’s own kikizake-shi, adding that a common misconception in this country is that sake should always be served hot.